Elegant. Stable. Quick to install. 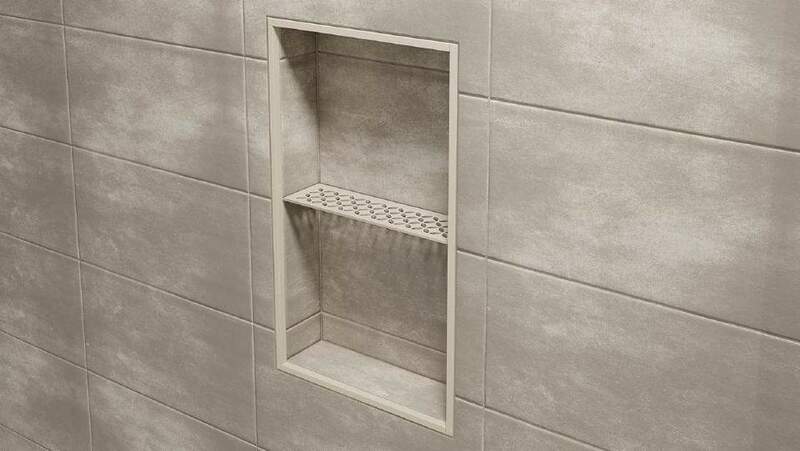 Schlüter-SHELF is a stylish addition to showers and much more. The shelf in elegant STYLE design offers a practical storage surface whatever tiles are to be installed or already exist. For example, in the form of Schlüter-SHELF-E - a corner shelf available in three different shapes. 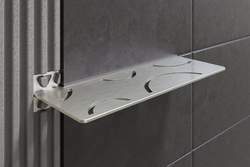 The wall shelf Schlüter-SHELF-W is integrated into the tile assembly during tile installation. The tiles completely cover its anchoring legs. That makes the elegant shelf particularly sturdy. All Schlüter-SHELF products can be mounted without drilling. While Schlüter-SHELF-N is simply integrated into the matching Schlüter-KERDI-BOARD-N niches, Schlüter-SHELF-E is suitable for retrofitting at any time. Schlüter-SHELF adds order and storage space to your bathroom - in the typical elegant style you've come to expect from Schlüter. The practical wall shelves also are a great fit for other tiled residential spaces: they can be easily integrated into tiled kitchen surfaces to provide storage for spices and cooking utensils. The wall shelves, available in five different shapes, are integrated into the tile surface without drilling, creating a stylish look. Schlüter-SHELF offers a choice of the design variants FLORAL and CURVE. 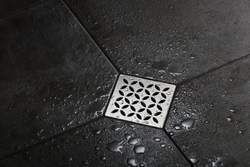 The same pattern can be found in the point drainage Schlüter-KERDI-DRAIN-STYLE and the linear drainage Schlüter-KERDI-LINE-STYLE. That creates a uniform bathroom design. Classic elegance or tone-on-tone to match the colour of your tiles and joints. Schlüter-SHELF in the material varieties brushed stainless steel and aluminium with structured coating is available in the TRENDLINE colours ivory, stone grey and dark anthracite, offering the right solution for every style. 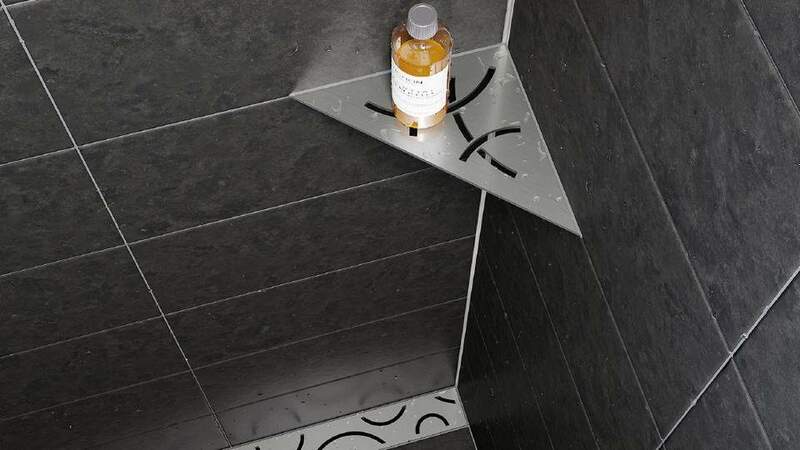 Schlüter-SHELF is not only suitable for use during tile installation. 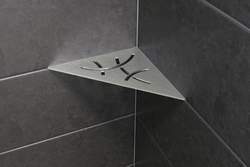 The subsequent attachment in the existing tile joint pattern couldn't be easier: Measure - carefully remove grout in the desired location - insert SHELF - apply silicone - DONE! Schlüter-SHELF-E-S1 is a corner shelf in the shape of an isosceles triangle. This shelf solution with a depth of 21 cm is particularly space-efficient and can easily be retrofitted without any drilling. Schlüter-SHELF-E-S2 is a corner shelf for retrofitted installation in the shape of a truncated square. As with all Schlüter-SHELF variants, it is available in the material finishes brushed stainless steel and aluminium with structured coating in the TRENDLINE textured colours ivory, stone grey and dark anthracite. Schlüter-SHELF-E-S3 is the right solution if you need to store a lot of accessories in a small space. 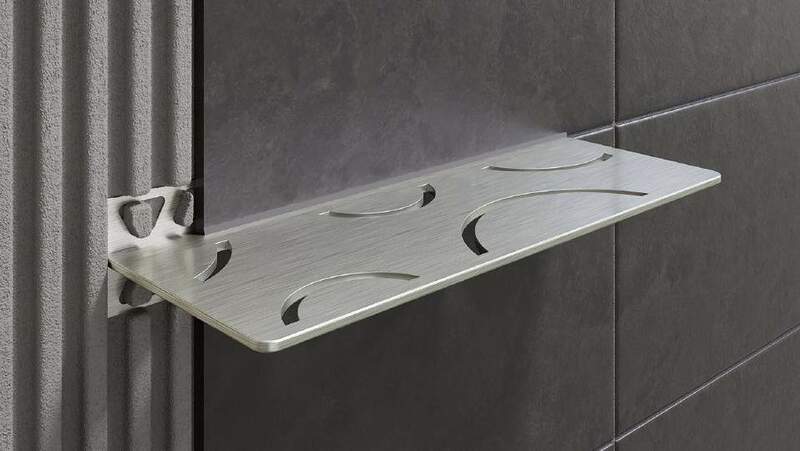 The rectangular corner shelf can be retrofitted installed and is available, just like all other variants of Schlüter-SHELF, in the designs FLORAL and CURVE. 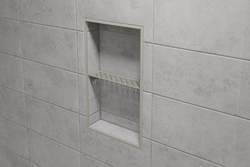 Schlüter-SHELF-N is simply fitted into niches made of Schlüter-KERDI-BOARD-N during tile installation. The shelf creates a centre storage area in your niches and visually matches the TRENDLINE profiles and the drainage solutions KERDI-LINE-STYLE and KERDI-DRAIN-STYLE. 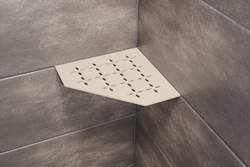 The rectangular Schlüter-SHELF-W is integrated into the wall during tile installation, with tiles completely covering the anchoring legs. This makes the shelf particularly sturdy. Like all options available for Schlüter-SHELF, the product is installed without drilling and once installed its discreet design provides a functional decorative solution. Download free information material now! 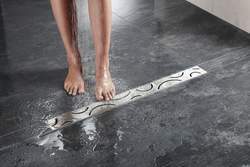 Schlüter-KERDI-LINE-STYLE are elegant contour frames made of brushed stainless steel for linear drains. The covers are available in the design variants FLORAL, CURVE and PURE. 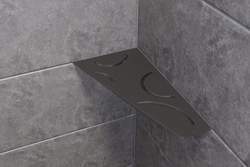 Schlüter-KERDI-DRAIN-STYLE are elegant design covers made of brushed stainless steel without frame for replacement in existing installations. The design covers are available in the variants FLORAL, CURVE and PURE.